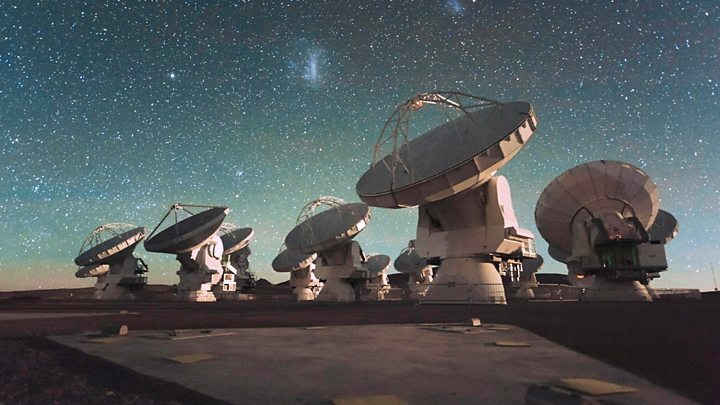 They have built an Earth-sized "virtual telescope" by linking a large array of radio receivers - from the South Pole, to Hawaii, to the Americas and Europe. 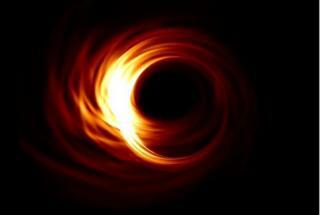 In the sights of the so-called "Event Horizon Telescope" will be the monster black hole at the centre of our galaxy. But as colossal as that sounds, the "edge" of the black hole - the horizon inside which an immense gravity field traps all light - may be no more than 20 million km or so across. "There's great excitement," said project leader Sheperd Doeleman from the Harvard-Smithsonian Center for Astrophysics in Cambridge, Massachusetts. "We've been fashioning our virtual telescope for almost two decades now, and in April we're going to make the observations that we think have the first real chance of bringing a black hole's event horizon into focus," he told BBC News. The EHT's trick is a technique called very long baseline array interferometry (VLBI). Media captionSheperd Doeleman: "It's never a good idea to bet against Einstein"
Simulations rooted in Einstein's equations predict a bright ring of light fringing a dark feature. "Now, it could be that we will see something different," Doeleman said. "As I've said before, it's never a good idea to bet against Einstein, but if we did see something that was very different from what we expect we would have to reassess the theory of gravity. "I don't expect that is going to happen, but anything could happen and that's the beauty of it." Media captionKatie Bouman: "If we could make movies it might help us pull out extra information"
Its extraordinary state-of-the-art technology has at a stroke increased the EHT's sensitivity by a factor of 10. Hence, the optimism ahead of April. Nothing happens on the spot - the hard drives must first be flown to a large computing facility at MIT Haystack Observatory in Westford, just outside Boston, Massachusetts. "Our hard-drive modules hold the capacity of about 100 standard laptops," said Haystack's Vincent Fish. "We have multiple modules at each telescope and we have numerous telescopes in the array. So, ultimately, we're talking about 10,000 laptops of data." It is in Haystack's correlator computer that the synthesis will begin. Some very smart imaging algorithms have had to be developed to make sense of the EHT's observations, but it will not be a quick result. Katie Bouman, from MIT's Computer Science and Artificial Intelligence Laboratory, thinks it might be possible to capture this movement. "We want to push boundaries and to try to make movies from the data," she told BBC News. "Maybe we can actually see some of the gas flowing around the black hole. That's really the next stage of what we're trying to accomplish with these imaging algorithms." The strategy is to view the galactic centre at a wavelength of 1.3mm (230GHz). This has the best chance of piercing any obscuring gas and dust in the vicinity of the black hole. But if there is too much water vapour above the array's receivers, the EHT will struggle even to see through Earth's atmosphere. If there are flaws to be found in Einstein's ideas - and scientists suspect there are more complete explanations of gravity out there waiting to be discovered - then it is in the extreme environment of black holes that limitations should be exposed.